Heartburn is a painful burning sensation experienced in the chest below the breastbone due to the reflux of the acid from the stomach into the oesophagus. The reflux is a result of the relaxation of the lower oesophageal sphincter muscle (LES) which gives way for acid backflow. The LES is supposed to stay tight under normal conditions to prevent the backflow of stomach contents. However, its relaxation is triggered usually due to poor diet, unhealthy lifestyle, alcoholism, smoking, obesity, and several other pathophysiological factors. Heartburn is a very common disease which can be treated rather easily using simple home remedies and OTC medications. A chronic form of heartburn, called gastro-oesophageal reflux disease (GERD), however, can occur if acid reflux is neglected. In this article, we discuss fenugreek and investigate is if can help with heartburn problem. Fenugreek is a popular plant which is used as an edible in food items and as medications for several disorders. Fenugreek seeds hold a long history of use in Ayurvedic and Chinese medicine. Its use was first described on an ancient Egyptian Papyrus which is dated around 1500 BC. Fenugreek is used for a variety of medical conditions such as menopausal problems, controlling diabetes or blood sugar, treating loss of appetite, increasing milk production in breastfeeding women, inflammation on the skin and several gastrointestinal ailments. Fenugreek seeds are taken usually by mouth for medical conditions in the form of ground dried powder or soaked seeds. The paste of its seeds is also applied in the skin for skin infections. It is also used in hair masks to enhance hair strength and volume. Fenugreek is widely used to treat gastric problems such as constipation, loss of appetite, gastritis (inflammation of the stomach), indigestion and most importantly, heartburn. Although fenugreek is being used widely across the world to treat heartburn and other gastric disorders, there is a little scientific evidence, supporting its effects. In research done at Dublin, Ohio, USA, a nutraceutical company formulated a fiber product from fenugreek that treats heartburn. The research supported the fact that fenugreek when taken in controlled amounts for 2 weeks, twice a day before meals, reduce the occurrences of acid reflux in patients. Its effects are similar in intensity and efficiency as an antacid taken to relieve heartburn. What it means: fenugreek seeds, though less researched, are very effective in reducing heartburn at the rate similar to that of an over the counter antacid or an anti-reflux medication . Our stomach is coated with a thick mucus layer that protects the stomach cells from the damaging effects of the corrosive acid. In heartburn, due to excessive acid attack, this mucus layer disrupts and the inner cells are exposed to the acid. Fenugreek seeds are found to be rich in polysaccharides that form mucus-like substance. This mucilage content of fenugreek has been found to dissolve in the saliva and enter the stomach. It coats the stomach wall and protects it from the acid attack. What it means: fenugreek seeds being rich in polysaccharides that form mucilage, can coat the stomach wall and protect it from the damaging effects of the acid, thus ameliorating heartburn and its painful symptoms. Oxidation and inflammation are the two major after-effects of acid reflux. The acid damages the oesophageal wall which activates certain chemical factors that lead to inflammation and oxidation of the tissue. Activation of the factors called cytokines leads to inflammation whereas activation of reactive oxygen species leads to oxidation of the tissue. Both these factors cause further damage to the oesophagus and its cells causing pain, ulceration and even cancer. In research on healing properties of fenugreek, it was found that its mucilage contains certain elements that inhibit the enzymatic compounds called cyclo-oxygenase and lipo-oxygenase. Both these enzymes activate the cytokines and cause inflammation. Apart from this, the mucilage also contains properties that suppress damage induced production of reactive oxygen species like peroxide in the cells. It also has the power to enhance the production of an enzyme called GSH which helps scavenge the reactive oxygen species in the tissues. What it means: mucilage from fenugreek seeds contains factors that suppress inflammation and oxidation of the acid damaged tissue I the gut. It thus prevents the pain and other inflammatory and oxidative effects such as ulceration, hernia and cancer . Indigestion is one of the biggest culprits that cause heartburn. when the food is not digested properly, it stays in the stomach until it is completely broken down. This increases the production of acid in the gut and disturbs the pressure on the LES making the extra acid more susceptible to reflux up. 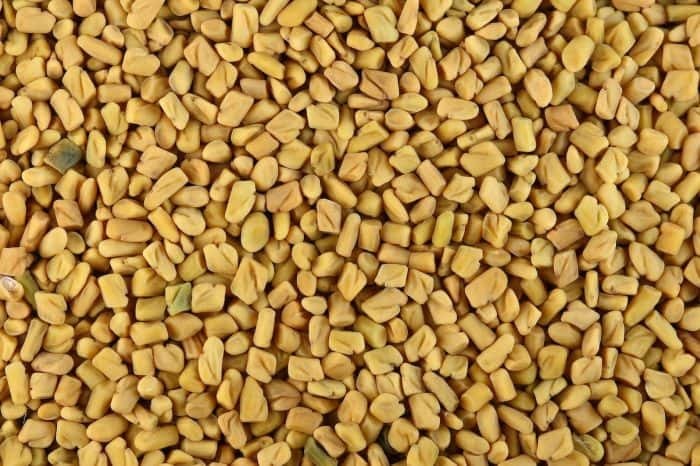 Fenugreek seeds help cure heartburn by reducing the incidences of dyspepsia. Eating fenugreek seeds before meals help ease up the digestion process and increase its efficiency too so that the food is not retained for long in the stomach. What it means: fenugreek seeds help reduce incidences of indigestion that ultimately help reduce the probability of acid reflux and heartburn. Though fenugreek is widely used in many countries to treat several disorders, due to lack of research and evidence, there is no standard dosage available in medicinal amounts that could be officially prescribed to the patients. In general, a spoonful of fenugreek seeds (soaked or dry; powder or whole) is taken 30 minutes before a meal by mouth for 2 weeks. This has been shown to reduce incidences of heartburn in human subjects. There are a few side effects of fenugreek, but none serious. Fenugreek if taken in large amounts can induce diarrhoea, gas and bloating. It also holds a history of inducing childbirth, so pregnant women should take precautions while taking it. It is always advised during pregnancy to consult healthcare provider regarding any natural remedies. Fenugreek is a widely used but a little researched natural product that can effectively relieve heartburn. Its mucilage is found to be very effective in protecting the gut wall from acid attack. It also has high anti-inflammatory and anti-oxidant properties that prevent ulceration, pain and bruising induced by heartburn. despite its efficacy, its actual dosage and side effects are not well evidenced which is why care should be taken while consuming it.